April 2019 Trolleybus + Wheels + Bus Fare. Why not join the BTS? In 2017the Society purchased the bungalow and property adjoining the Trolleybus Museum at Sandtoft. On 5 October 2018 the Trolleybus Museum announced that it had purchased another 1.5 acres of land, mainly adjoining the western boundary of the BTS land. The Society's Committee and the Museum's Board of Directors are working closely together to develop a strategic plan that meets the specific needs of the Society and the Museum and will eventually result in a much improved visitor experience. This will include a spacious Exhibition Hall where visitors will be able to view selected trolleybuses and an exhibition telling the story of the trolleybus in the UK. The Society's most recent acquisition, Bournemouth 301, seen here on Christchurch turntable while on hire to the Reading Transport Society (as we were then known) on 29 December 1968, moved to Sandtoft at the end of October 2018. 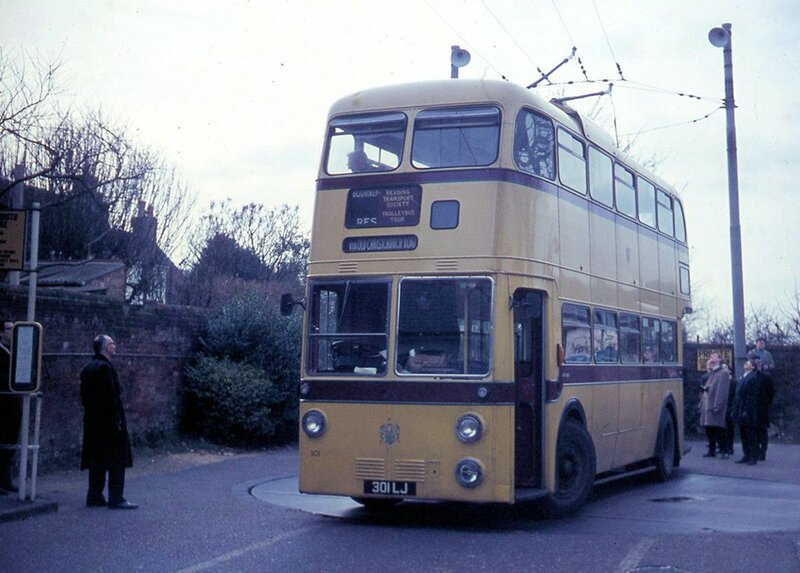 301 was the last new trolleybus to enter service in the UK. READING ANNIVERSARY Last year marked the 50th anniversary of the closure of our "home" system, Reading, where the Society was founded in 1961. We held an exhibition of Reading trolleybus artefacts in Reading Museum and the British Trolleybus Society and Reading Museum jointly hosted two very interesting speakers for an informal get-together as part of BLACK HISTORY MONTH called 'Come and Drive Our Buses'. We also held a free film show in Reading Town Hall co-presented by Dave Hall and Peter Whitehead showing old cine film and digital photos of Reading's trolleybuses which was attended by 180 people. Our events were made possible by Heritage Lottery Funding. On Saturday 3 November 2018, Reading's last trolleybus, 144, was parked outside Reading Town Hall as part of a family fun day, organised by Reading Museum. Dave Hall's new Reading Trolleybus book was also launched at the event and sold very well. 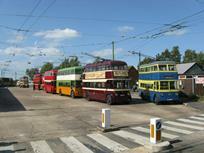 The British Trolleybus Society owns a fleet of historic trolleybuses, details of which are in the Fleet List pages. 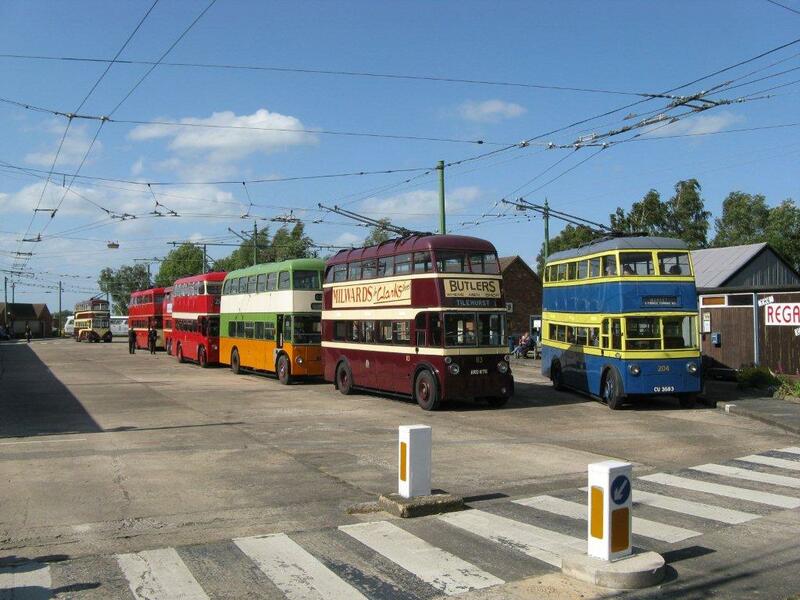 The BTS also contributes to the management & operation of the Trolleybus Museum at Sandtoft, which houses the largest collection of preserved trolleybuses in the world, and we now own the adjacent property, which will be incorporated into the Trolleybus Museum. In addition to our monthly magazine, ‘Trolleybus’ we publish local bus newsletters for Reading and the Thames Valley (Bus Fare) & West Yorkshire (Wheels). A free copy of 'Trolleybus' is available to prospective members. Either download a copy by registering using "Member Login", or apply to the Secretary who will post a printed copy to you. There are monthly meetings in London, Reading & Bradford, to which all are invited. We are partners in the publication of ‘Trolleybooks’, which cover historic and current systems in the UK and abroad. Britain's Lost Trolleybus Systems by Roland Box. Now being reprinted with minor amendments. "Lost" sold out in under thre months and so Trolleybooks has arranged a limited additional print run. This highly detailed book discovers the amazing number of towns and nearly all cities of Britain that planned trolleybus networks over the last century. We also have available currently, copies of David Bowler's 'Portsmouth Trolleybuses' which you can purchase here. These are post free while stocks last. The 2019 calendar is now available. LAST FEW COPIES REMAINING! Click here for details. A lovely set of six different scenes of Reading trolleybuses in service - click here to order! The organisation is run entirely by volunteers and is a registered charity No. 1033666. You can join us now! It's very easy to join the Society! Just click on "Why not join the BTS?" in the next column to find full details of how you can join and pay online or, if you prefer, send a cheque to our Membership Secretary. The annual membership rate starts below £20 for online-only membership.